Don’t ask us, ask our happy customers! 100% Satisfaction Guaranteed! Reviewed 5 Stars For Over Seven + Years Being in Business. Thank you! Hicks HVAC did a great job on my install! I needed new ducts for old 1912 house and 4 HVAC units for addition plus garage and work shop. Photos of my install are on their webpage and show the professional job they do. They were great to work with and very flexible as my project had many twists and turns. Call Jeremy and he will take great care of you too! Shawn H.
Jeremy promptly set up an appointment for first thing the next morning to come look at my HVAC unit. He took his time to diagnose the problem and explain to me everything that was going on. The price for the service was great, and my unit is working well. Highly recommended, and will be using him in a few years to replace my unit. Update: I had to have my old unit replaced, and I called Hicks again after my previous good experience with them. Their quote was very competitive, and they had my new unit installed within the week. Great service and communication. Brent B.
Jeremy was extremely helpful and informative. He was patient and answered every question I had. Very pleased, will definitely call again! Mark S.
Hands down, the best customer service there is! I have dealt with service experts for 3 years, a waste of time and money…and then found Jeremy online. Hicks is by far the best HVAC service in Nashville. Quick, attentive and gets the job done at a reasonable price. Thanks for the new furnace, you have my business and referrals. Brent C.
Was selling my home and had a minor HVAC issue. These guys were quick to assess the situation and get the work done in 36 hours. Very reliable and prices were reasonable. 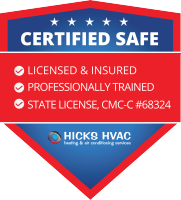 Hands down would recommend them to anyone in need of HVAC services David S.
Called Hicks HVAC to replace a heat pump compressor. Jeremy was on-site the next day and in less than 6 hours my A/C was working properly. Not to mention he beat all the leading “Big Guys” by a substantial amount in regards to monetarily cost. I loved the service received and how accommodating the entire HICKS HVAC team was in my situation. I would recommend them to anyone who needs professional, quality, reliable service. HICKS HVAC is now who I will rely on for all my HVAC issue. Steven C.